My work usually begins when I am walking – I make sketches, or jot down words. When I’m in my studio the starting point for my work is spontaneous and experimental and I work If you would likeon several pieces at once. At this stage, I prefer not to have any firm idea of what I am trying to achieve, and am happy to let the painting develop in its own way. 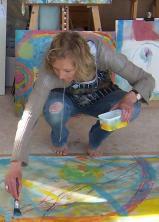 I return to each painting many times, to add texture and layers of colour. This stage of the process can take many months. There is always a pivotal moment in each painting, which may be in response to the landscape, a still life arrangement, or simply an interesting juxtaposition of colours or shapes in my studio - whatever it is, my final intentions are realised when all distractions are stripped away in a moment of clarity.